While this website provides a lot of informative content for you to read, sometimes a picture says it all. Click on an image to view the gallery in an enlarged format. 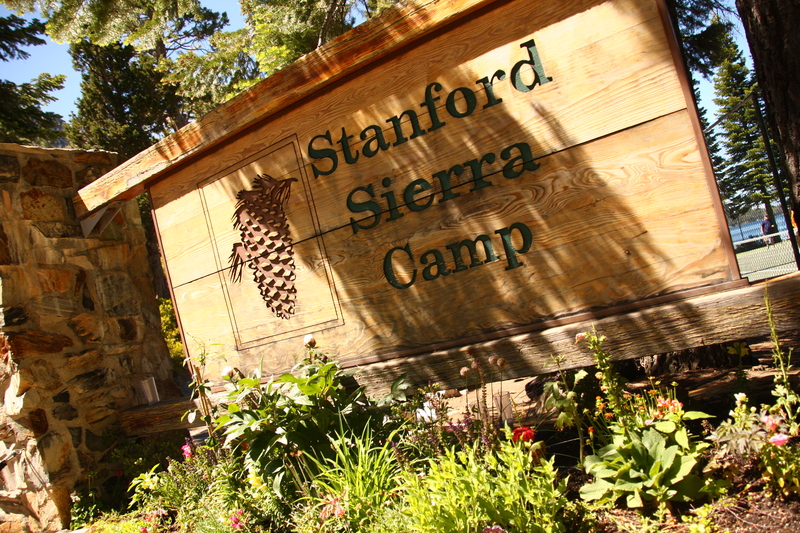 The main entrance to Camp welcomes you to your vacation getaway. Camp is situated on the southwest shore of Fallen Leaf Lake. …and South Lake Tahoe is only a 25 minute drive from Camp. …and there are open spaces for kids games, barbeques, and music hours. The Fountain, our Camp store, sells a wide variety of apparel and plenty of tasty treats. Weather at Camp is usually warm and sunny, but come prepared for anything! … or be active in Family Games Day at Baby Beach each Wednesday. …or grab a partner for the family egg toss. Younger ones love to showcase their sand castle building skills. …or take your best shot at our archery range. Join an improv workshop to add a humorous side to your week. Relax mind, body, and soul in one of our many yoga sessions. …or enjoy a game of volleyball on our sand court. Enjoy a Friday dinner accompanied by a lively musical performance. Suaves and Teens trek into the Lake Tahoe Basin each week on an overnight hike. … and give them plenty of opportunities to showcase their “goofy” side. Our staff also rarely miss an opportunity to wear goofy costumes for their shifts. Meet other Camp guests at Lower Falls during our Sunday social hike. Is it your birthday? If it is, you might get thrown in the lake! Camaraderie is a huge part of Camp. For hikers, Desolation Wilderness provides stunning views. …where as Cathedral Bowl offers a nice descent. …as does the view from the top of a peak. …when you can get out on the water and enjoy a morning row. …as our staff pull you for those perfect runs. …of which their favorite is the human pyramid. Our boat dock is conveniently located in the heart of Camp. …or send the kids out on one of our child-friendly funyaks. Our lifeguards constantly have their eyes on the water to keep you safe. We’re already on our way to help you right that turtled sailboat. For a great nighttime activity, head out on an Astro-cruise for spectacular views of the stars. Dress up in crazy costumes for a night of Disco Bingo! …or gather ’round the campfire as sun sets on the lake. …and provides a nice tune as you enjoy a s’more. Camp is a beautiful place to spend your summer vacation. “We Want You” to have a great week!